Our professional technicians have a lot of experience repairing and installing electric garage door openers of every make and model. We know how to recognize every problem before it exacerbates, and treat it quickly and effectively, so that it doesn't get a chance to develop any further. Your opener uses a motor in order to power the movement of your door. It generates the required amount of horsepower, and then uses some type of drive system – a chain, a steel-reinforced belt, or a threaded rod, otherwise known as a screw – in order to pull your door up. If even just one of the motor gears breaks, or becomes worn, your opener will be ineffective, and your door won't be able to move automatically. Our experts can replace the problematic gear (or gears) and make sure your opener returns to its fully functional self again. In order to keep your door from closing on a person or an object that finds its way under it, your opener uses a pair of photo-electric eyes. 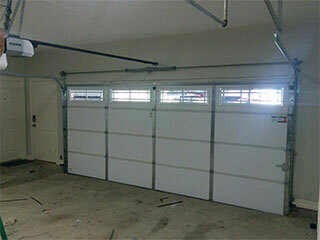 These sensors are attached to each side of your garage's opening, and they send an infra-red beam across the threshold. If that beam gets interrupted for whatever reason, these sensors alert the opener's logic board, which in turn reverses the door's operation. If the eyes aren't positioned correctly, however, then they won't be able to properly detect an obstacle. That means the door won't be safe to use until sensor realignment is performed. Since these are delicate components, it's best that you leave that task up to our specialists. Your opener's interior circuit board is very important. If a part of it gets fried during an unexpected power outage, or if some – or even just one – of its wires is detached, it will more than likely fail to work properly. Once again, our team can take care of these types of problems. Keep in mind that the risk of electrocution is always present when dealing with electrical components, so seeking out a professional for these issues is the advisable route to go. Garage Door Repair Middleburg is here to help you with any type of opener-related problem or task. Remember, we are always just a phone call away.